Ciambelline tuttoriso biscuits are made with loving artisanal care by Biscottificio del Roero. Only super fine rice flour, egg, butter and sugar: simple and natural ingredients that make these ciambelline biscuits uniquely light and crumbly. Perfect with afternoon tea, they can also be served after dinner with pastry cream or a chocolate mousse. They also make the perfect breakfast biscuit, to start the day with a burst of energy. Ingredients Rice flour 54%, butter, sugar, eggs, raising agent (E4501, E50011, wheat starch), milk powder, iodine salt, flavourings. Allergens: nuts, gluten. For more information on product labels, please contact our Customer Service department. The information on the labels of the products may vary for reasons beyond our control, therefore, there may be discrepancies between the information on the site and that on the products delivered. Please always check the information on the product before consumption or use. 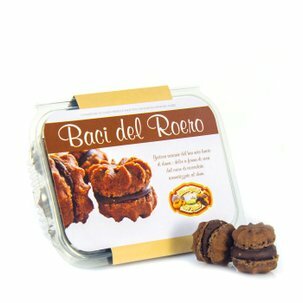 Biscottificio Roero was founded on the basis of a project that was embarked upon some 20 years ago by Luigi Roero and is today pursued enthusiastically by son and daughter team Alberto and Alessia. Their amazing products are made in an artisanal workshop where all stages of the process are handcrafted as in the past, in strict compliance with the original recipes. The decision to refrain from automating even the smallest part of the production process was difficult and complex, but it achieves its purpose of producing an absolutely unique result that will delight at each bite.